The following article is based on a recent client conversation and could be of value to anyone interested in using a whiteboard to improve sales performance. 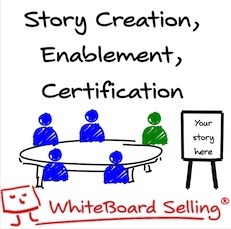 My client who asked to remain nameless, works in a technology company and has been using a whiteboard to tell her story for about 6 months; she is a fan of Paper-Show digital paper for remote whiteboarding as she does most of her selling virtually. Using the WhiteboardSelling Methodology, we worked with her team and created a powerful whiteboard story and helped her team develop mastery over the material in a Whiteboardselling Symposium. Recently they started using the whiteboard during the introductory call to capture the client issues and it has made a big difference in their ability to qualify. In the past, they held a 15 minute telephone call to understand the client's issues and to qualify them better before inviting them to a whiteboarding session. If qualified, they would then schedule a whiteboard session using Gotomeeting and these whiteboard sessions were usually well received by clients. I asked Shirley what she thought of their new process. "In the introductory call we don't talk about our products or service at all, except for the big-picture to frame the conversation, this is pure discovery. Our top reps have complete confidence in telling our story and pretty much own the message; this means they can focus on the interaction with the buyer, rather than worrying what to say next. Since we started using the whiteboard to capture the initial conversation, discovery has improved dramatically and our pipeline quality has improved. Not all of our reps have adopted the whiteboard in discovery yet and are sticking to the telephone only approach for the first call." Using a whiteboard at the outset of a sales call for discovery disarms the client and they are typically intrigued by the interaction. Capturing client issues on the whiteboard and asking questions to drill down on problems and goals helps the client to open up when they might otherwise remain silent. Using the whiteboard for the discovery conversation, before telling your story improves diagnosis and qualification and increases pipeline quality. Instead of jumping in to your story, which most sales reps love to do, you are capturing the buyers story and drawing them out on the issues that are important to them. Let me ask you a question...Which is more valuable at the outset of the buying cycle? A whiteboard is an excellent way of creating consensus around next steps and gaining commitment to taking action. If you have done a good job with the discovery session, it will usually run over the time allocated and the client will want a copy of the whiteboard. What is the Difference Between Qualifying a Sales Prospect In or Out? If you ask any group of salespeople what the difference is between qualifying a sales prospect in, or qualifying out, you are bound to get an interesting and varied set of answers. If you asked what the impact would be of each of these approaches on their bank balance, you still might get a quizzical look. CSO Insights publishes an annual Sales Performance Optimization Survey (SPO) of Chief Sales Officers (CSO), which provides detailed information on several hundred sales and marketing performance metrics. These metrics serve as benchmarks for sales leaders to evaluate their own performance. 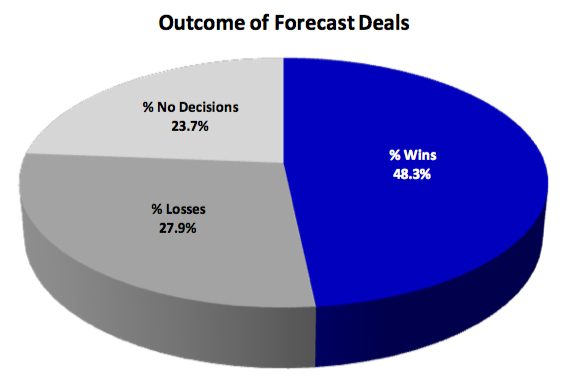 In CSO Insights SPO 2012 survey, there was an interesting chart on the outcomes of forecast deals.....nearly 1 in 4 deals was lost to no-decision with a further 28% lost to competition. Anything we can do to reduce the impact of going the distance in a deal and ending in a lost or no-decision outcome is worthwhile and an imperative for sales leaders. As a sales consultant I am a reader of sales blogs and books for new ideas and insights and when I came across Mike Bosworth and John Hollands's book Customer Centric Selling in 2004, I read it with interest and recommend it for B2B sales professionals. There is one technique in the book that I have used and integrated into our strong qualification process that I think is very powerful in improving qualification and its called Qualification Confirmation and I recommend it. 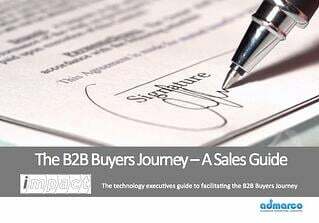 The Meeting Summary Letter, or Qualification Confirmation as it is referred to in the book, is one of the most valuable process steps in the toolbag for sales professionals selling in the B2B technology space. Like many sales tools, this isn't rocket science, just better process. One small addition to my follow-up letters has made a huge difference forecasting and eliminated most deals, where a no-decision or loss is a likely outcome. 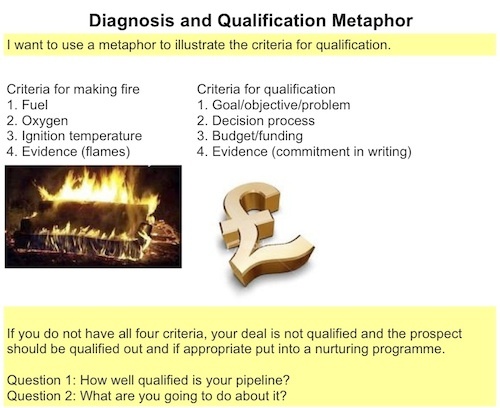 What the authors realised is that without getting the buyers confirmation of what you understood was discussed and agreed in the meeting and confirming buyer commitment to next steps, a deal is not qualified and effectively the sales person has no control without it. Regardless of the qualification system you use, if you add this simple technique to your system, it will give you the evidence you need to know that buyer is engaged and interested in next steps. An interested buyer will confirm in writing in an email reply or on the phone, their agreement to your letter, or negotiate variance to your summary or next steps within a few days of the meeting. When the buyer does not make the meeting you set up to review the letter and goes radio-silent and does not respond to email or phone calls, there is little chance of an outcome and the deal should not be forecast or qualified until this occurs....but don't hold your breathe. I have been using meeting summaries since I first started selling - (a long time ago) and adding this simple statement has made them much more powerful. Next Steps - (This is where you nail down who's doing what and ask for introductions to key decision makers involved). The following phrase is the key " please confirm you are in agreement with my summary of our meeting"
The letter should close the buyer with a commitment to a phone-call or in-person meeting to review the letter and discuss any variance or next steps within 7 days. If the buyer does not confirm or correct your understanding in the letter, you don't have a deal. No interest = no deal and you have to go back and find out what you missed. Read Customer Centric Selling, you can order it here. Use a Meeting Summary after every meaningful meeting with a buyer to confirm qualification and next steps...this could mean you write quite a few letters in a large transaction, so you need well written proformas loaded in your CRM tool that you can quickly customize. The meeting summary, if well written can serve as a selling vehicle for you inside the buying organization. 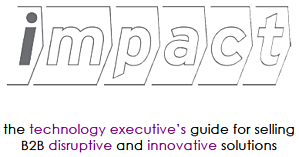 The meeting summary is particularly useful in overcoming weak mentors in the MENTOR phase of the IMPACT buying process and gaining access to a champion or decision makers. Understanding the buying process and how to help your mentor position your idea is discussed in the the book Why Killer Products Don't Sell....if you don't want to buy the book, you can download the ebook below. Death and taxes are the only certainties in life, and this method is not fool-proof, but if you implement Qualification Confirmation in addition to your current process, it will improve your qualification and close ratio. Effective qualification will give you more time to work on deals that will close and that will improve your sales results as well as improving forecasting accuracy. Sales Enablement - what is it? In the post-Internet era, the behaviour of buyers has radically changed, unfortunately selling behaviour hasn't changed much.